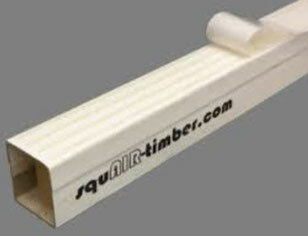 The name squAIR-timber might not at the moment mean much to most of our readers. However, airlines across the globe are constantly involved in finding new measures to reduce the weight of their aircraft and hence, save fuel and cut costs further. This is where maybe squAIR-timber could end up being an added bonus for the air cargo industry. During the buildup of aircraft pallets with heavy, sensitive or bulky cargo, it is often necessary to use timber as a means of being able to distribute the weight evenly over the aircraft (cargo) pallets. Traditionally, this has been effected with the use of wooden beams of various sizes and weights, depending on what type of cargo is being loaded. Airlines, or better said, handling agents, have been spending enormous sums during the past decades in purchasing timber beams which are used on pallets and which they never see again because they tend to disappear at destination. On top of this, wooden beams on aircraft pallets mean more weight and hence the loss of revenue paying payload. If the squAIR-timber product kicks off, then it could be that this problem will disappear and carriers will rejoice at being able to lift more cargo! How is it planned to work? ‘trilatec technical solutions’ - a company which is based in the German town of Merzig, a stone’s throw away from the Luxembourg border, offers cost and weight saving solutions to the logistics industry - in particular the air cargo world. These, among others, include slave-pallets and special straps for aircraft cargo tie-down. They have come up with a new product named as “squAIR-timber.” This new weight-saver was introduced recently at the opening of their new facility in Ginsheim-Gustavsburg, near Frankfurt Airport. The event was attended by around 50 representatives from the air cargo industry who were led through the new facility and shown what trilatec considers as being the advantages of using squAIR-timber. In essence, squAIR-timber beams are produced by using compressed cardboard beams which are then surrounded by a lightweight (see photo) covering. The producer claims that this new form of pallet shoring material is 80% lighter than traditional wooden beams, has only a weight distribution of 1.2 kilos/m, saves around 125 kilos weight per unit where it is used, can take up to 10 ton loads on each pallet and spares time for handlers on pallet buildup. On top of this, squAIR-timber beams are easily stored for further reuse or when needed, transport back to origin. 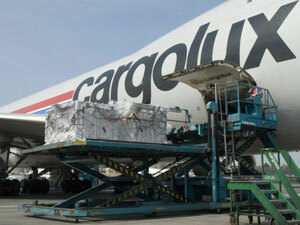 Cargolux is convinced that by using only this form of shoring for general cargo that they will generate more payload and reduce fuel consumption on their fleet by around 1,200 tons per annum. This in turn then results in less aircraft engine emissions into the atmosphere. Pallet build up times are said to be much shorter, doing away with the need of forklifts on pallet buildup. 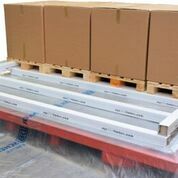 By winning around 125 kilos per pallet on payload - then carriers may well have a cheaper and efficient tool to generate more revenue in the future.